flask | Is life worth living? SAR visualization with RDKit ver2. Somedays ago I posted SARviz test code using RDKit. It was based on command line type. So, I think it is easy to use for applying SDF etc but not familiar for chemist. Next step, I tried to make very simple web-app using sarviz.py. Structure of app folder is following. – chemolib folder stored library for calculate molprop. and make image. – dataprep folder strored sklearn predictive model as pkl format. App.py is main code of this app. # this is test app for SARviz. # predict active / nonactive as integer and save image. And one of key function is sarviz.py. I used uuid to avoid crash of names. I added some function to calculate molecular property. Property will be provided for user as table format. # this is core function of SAR visualizetion. # probability function returns 2 x 1 matrix. Following code shows only results.html. I uploaded all code to my github repo. Using Flask-Boot strap for good visualisation. User get query input page. Then push button, prediction will start and image will be generated. This accuracy of this app depend on performance of sklern model. Readers who are interested in mishima.syk, I recommend check following URL. The event will be held on 28.Mar.2016. And my code was uploaded to my repo. Now I’m coding simple design-tracking system. Almost looks like a blog service. I use Flask as web app flame work. But I’m not good at web design. It’s difficult for me to make form template. There are some extensions about Flask. And I found that using Flask-Bootstrap( Bootstrap ) make easy to beautiful layout. Key point was that, wrap form tag with <div class=”form-group tag”> and set “form-control” class in form.field. This code will make following view.. Draw Molecular Matched Pair as SVG. Somedays ago, I posted drawing molecule as SVG using RDKit. So, I challenged draw MMP as SVG. 1. Generate MMP using RDKit. 2. Store MMP data to MongoDB. 3. Provide MMP data to user using flask. 4. Draw structure on the fly using Ajax. Step 1 is skipped. If reader who want to know how to generate MMP using RDKit I recommend check http://www.rdkit.org/. Data is stored in MongoDB like json format. jquery, footable are very cool and useful. App.py is very simple script. Root page provide toppage and _moldraw function return mmp as SVG. I used simple tricks for draw molecule, using transform data to highlight structure that is transformed. Footable.js is very easy to use and it can generate cool table view! 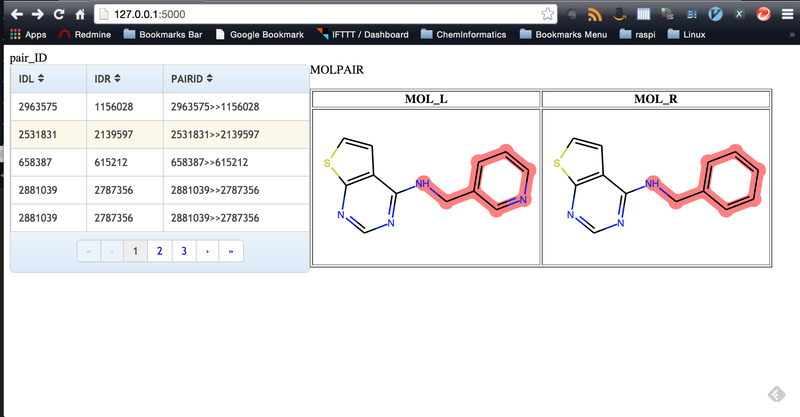 I used jQuery to show molecule when user mouseover the pairID. Run the script from terminal. Upload code snippet to myrepo. I want to align pair molecules core, but it can not now. Lots of relationships are presented as graph. For example, if I set molecule as node, and similarity as edge, I could make molecular networks. 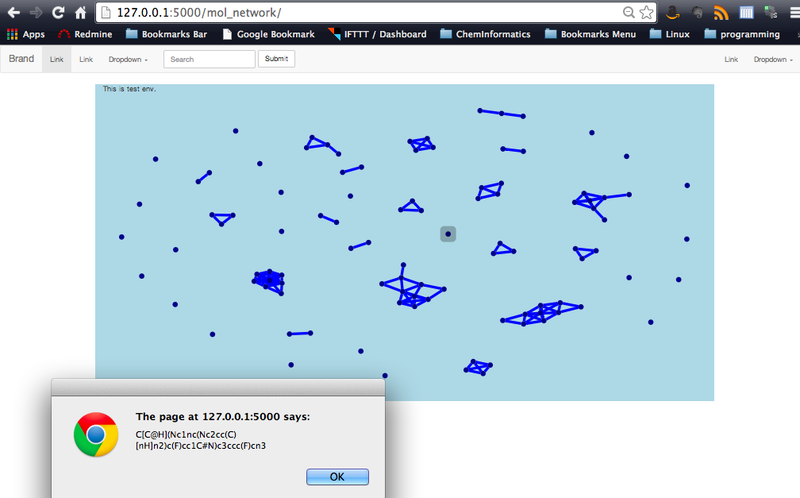 Cytoscape.js is one of the good tool. If you interested in it, please read following ;-). Then load data and make network structure as json. Now I got network data. Then, let’s make the site using flask. Next, wrote template.html and mol_network.html. Follwing code, links and any actions are blank. // set your placed folder following code. OK I did it. Then run the localserver. Yah! I could make molecular network. And tap each node, the site return smiles strings. 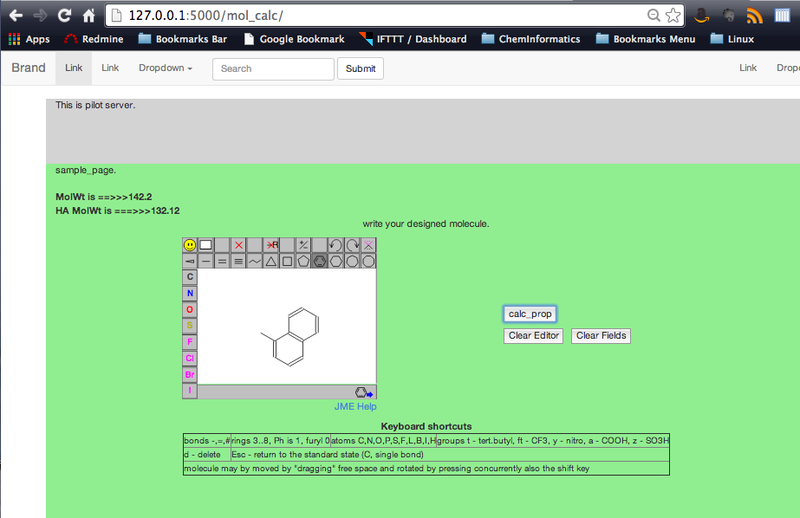 I build very simple portal site in my lab, that can predict some physchem value using structure designed by med chem. Ajax is very powerful because it can return results without screen translation. So, I searched google, and some books and write simple snipet. And, my folder structure is following. Flask uses template engine jinja2. And templates are placed in templaes folder. Useing this script, If I access /mol_cal/. I’ll get mol_weight and heavy_mol_weight as json format. 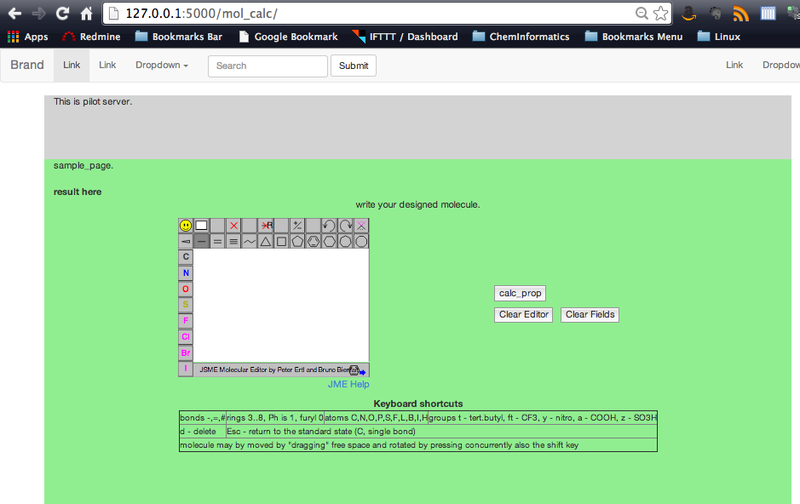 Next, wrote template.html and mol_calc.html. submitsmile is function that get smiles from jsme_draw and encoding smiles to url format. Then ajax fuction get the url and rdkit calc mol prop. Access the site and write structure, then push calc button. It works well :-). I could get result without any page transition.